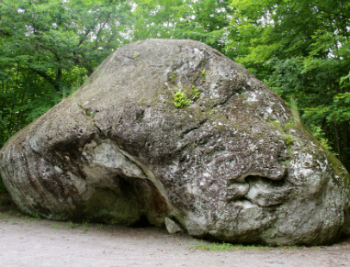 At Bleasdell Boulder Conservation Area, you can take a journey through time with a short hike to the 'Bleasdell Boulder', one of the largest known glacial erratics in North America, estimated to be 2.3 billion years old. The Bleasdell Boulder, also known as the Glen Miller Rock, was studied by Reverend William Bleasdell in the 1800s who wrote of the rock in scientific journals and so brought it to the attention of geologists across Canada. The Boulder measures 13.4 metres long, 7.3 metres wide and 6.7 metres high (44’ x 24’ x22’). That’s over two stories tall! Apart from the Bleasdell Boulder, you will see a wide variety of trees, flowers, and ferns. You may find beaver activity, rabbits, hare, weasels, raccoons, fox, deer, squirrels, chipmunks, grouse, hawks, waterfowl, songbirds, reptiles and amphibians. Lower Trent Conservation welcomes hiking, birding, and fishing enthusiasts and is always welcome to families. The exceptionally well maintained trails can be accessed from the parking lot. A .6 km link trail connects to the Lower Trent Trail, a 17 km non-motorized trail along the former rail bed between Trenton and Glen Ross. For those interested in geocaching, the Boulder is the site of a newly established “EarthCache”. This particular type of cache does not involve people looking for the traditional box, but rather introduces people to unique and special places through web-based listings. A note about the Founders: In 1997, Paul and Maria Heissler purchased the property with the intent of making the 'Boulder' accessible to the public. They founded the Bleasdell Boulder Preservation Corporation to ensure the preservation of the site for future generations. Members of the groups worked hard to establish trails, parking areas and interpretive signage. In 2005, the property was donated to Lower Trent Conservation. With new trail improvements, bridges and signage, Lower Trent Conservation remains committed to the Heissler's vision of providing public access to this very special place!